Essentially, local to all of us, I would toss in the Bat People of the Moon. 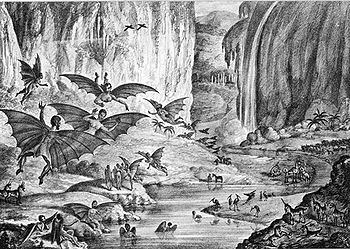 In 1835 when The Sun wasn’t selling enough papers, they published a series of articles about how bat people had been discovered on the moon because - pah! - journalistic integrity wasn’t invented yet. Probably plagiarized from Edgar Allen Poe, the world got swept up in it. The paper never retracted the story. As I recall, that kid’s father told her, “If you see it in The Sun, it’s so” (which is why she wrote to the editor to clarify the Santa Claus controversy). So, hmm, bat people on the Moon? Maybe we just haven’t been to the right part of the Moon yet. I actually love that it became a legit paper. Especially knowing that the thing that saved it from bankruptcy was such a ballsy con job. Could have been plagiarized from an older story / civilization. There are lots of Mayan beliefs to this day about bat-people and the moon , and the ancient Mayans had a bat god associated with the moon , Lord Zotz. There’s this very stupid big orange menace – some say he is even the president of the united states! It is awful, and certainly the scariest cryptid of all: please convince me that he is not real!! My wife and I saw one of those “mangy coyotes” in the pasture behind our house around 2004 in broad daylight. About a year later I saw it, or one like it run across Highway 56 in Ector, Texas. We’ve both had very good looks at it and are sure it is a coyote with some kind of terminal mange. My own suspicion is that it is a victim of the Texas coyote eradication program that used experimental poisons after trapping and hunting failed to reduce the increasing numbers. When Whitley Strieber posted a photo of a “chupacabra” that looked identical to the ones we saw I wrote him to say that there was nothing paranormal or alien about these poor creatures and the elongated snout and long canines were merely seemed exaggerated due to the lack of hair. That was not what he wanted to hear from eye witnesses. But all the photos from here in Texas show the same critter and us country folk have seen our share of coyotes and mangy dogs. My only concern was that this condition might be a new form of natural disease but I have not seen any any sign of an outbreak of it. Sightings of these animals are still uncommon so I wonder if the condition isn’t fatal. I’d still like to know what causes it in order to take precautions with our dogs. I haven’t had to treat a dog for mange in years. I’ve never heard about anyone seeing one locally, but I don’t think it’s out of the question given the region. That would be almost as cool as a chupacabra, TBH. The Sonora Desert Museum in Tucson has coatimundi but I never could spot them in the exhibit as a child so I haven’t actually seen one in person despite being in near proximity. No, it’s not a coati. I had two of them hanging around an abandoned house on my property when I first dug in for the duration around '86. We’d had them down in the Lower Rio Grand Valley but they were getting scarce by the time I left in '85. I was really surprised to see them this far north but my neighbors had spotted them too occasionally when feeding their cows. It’s going on 20 years since I last saw one so I figure some yahoo from town shot them. We had one timber wolf prowling the creek when I got here but I haven’t seen or heard him for years. We’ve also had a Bigfoot come through every year around deer season. My wife and I have seen his track in the lower pasture, and he (or she) was here when I arrived. My neighbor and I used to call him the Screamer, because of that bloodcurdling cry he made that left livestock in the area stirred up for days. He ran in front of my daughter’s car late one night when she was returning from work and she got a pretty good look. 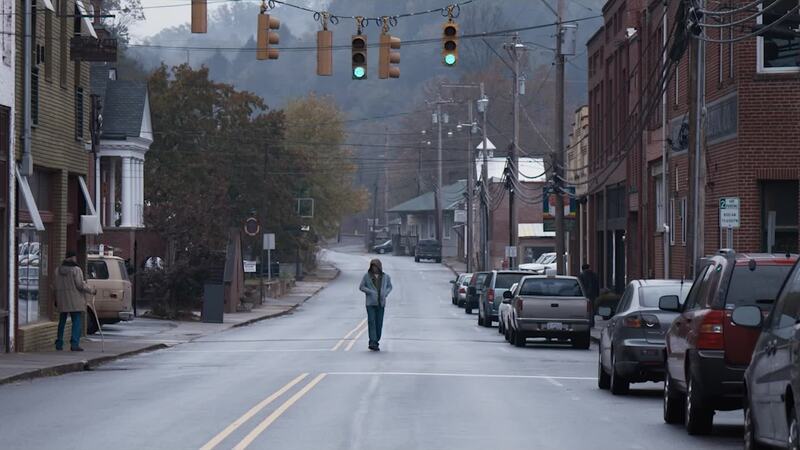 The next day she packed her stuff and moved to town. It took a couple of months for her to tell us about it. We understood completely. Several people here along the Red River have seen it since at least the '50’s but few will even mention it until they find out you live out here too. People, mostly town people, just laugh or worse, start ridiculing you, calling you a liar, superstitious hillbilly, crazy or all three. So most of us don’t even bother to report a sighting. Nobody believes they exist until they run into one. The rest of us don’t need to convince anybody. Aside from the 14 vanished dogs we’ve tried to have out over the years, it’s never bothered us and we return the favor. It’s very sad and disappointing the way thing have deteriorated in Mexico. When I lived on the Texas side of the border, whenever I would hear of some interesting place, I’d just jump on a bus and go the the nearest jumping off spot and have look for myself. I often met people who had family in rural Mexico and we would drive down for a visit. This is how I got to take a wonderful tour of the Sierra Venado on horseback and visit the wonderfully weird Quatro Cienegas long before the fossil human footprints were found there. Only a handful of people from Monclova ever visited back then. Just recently I learned of what is suspected to be the earliest human site in North America in the hills near Zacatecas. And though it takes about a week of burro packing travel to get there, I very much wanted to have a look. However, upon doing some background checking I learned it had also become a very hazardous region to go sight seeing. I looked around for a “sponsor” but the closest I found only had relatives living in Mexico City. Although the cities always had the same crime problems every major city has, I’d always felt the safest in the remote places. And the people were always the most gracious I’ve met anywhere, even in Chiapas and Guerrero where the civil strife seems never ending. Today I would be hesitant to even cross the bridge into Nuevo Progreso, Tamaulipas. 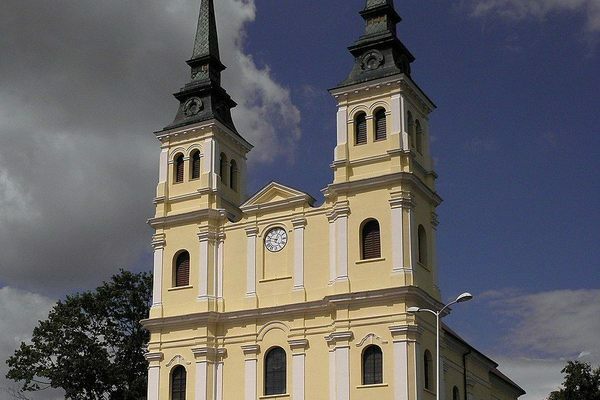 Legend says a giant, venomous spider dwelled within this Polish church. 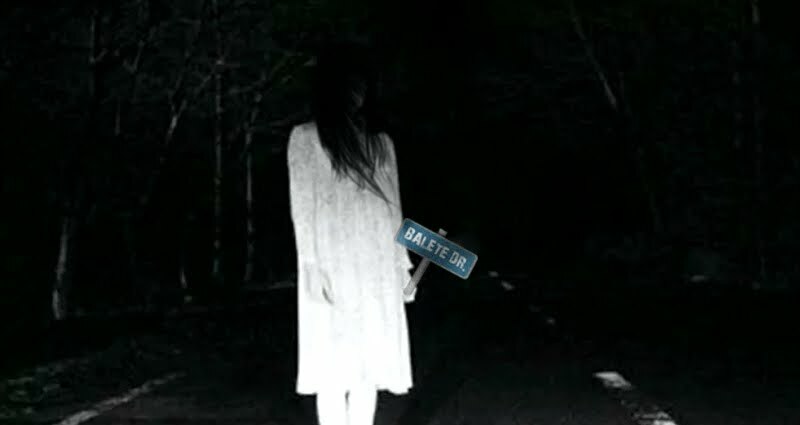 There is a street in the metropolitan area of the Philippines called Balete Drive that was well-known for the White Lady spectre that haunted the locale. It was said that she died in a horrible accident and is looking to get home/get revenge/find justice/what have you. Funnily enough, my brother-in-law grew up in an ancestral house by Balete Drive and gives no credence to the phenomenon. Here’s a link that explains more and also features other Philippine cryptids as well. As a bonus, the article links up to an Atlas Obscura entry located in Rochester, NY which, coincidentally, is where I’m at right now (not the castle, just the city). I’m glad that church is a long way from me. Got enough big spiders as it is. If there’s any truth behind the legend, it’s surprising that big spiders could live in such a cold place as Poland. Maybe it came over on a banana boat. LOL! I grew up in the Garden State which is famous for it’s Jersey Devil. I also lived in Glynn County, Georgia for a time where our local river monster was dubbed the “Altamahaha.” Now I’m in Virginia where I’m told we have a teeming Bigfoot population (known locally as “wood apes” or “wood boogers”). Of course, my favorite local legend is the “Bunnyman” but he’s more escaped-from-the-asylum maniac than cryptid. Either way, it makes for a good campfire story.